The Dead Sea: what is deader than dead? Haaretz, an Israeli newspaper, has a fabulous article about the Dead Sea which they call “Israel’s endangered natural wonder.” This report consists of an article, photographs, aerial footage, and an animated map showing how the Dead Sea is drying up. The article is by Nir Hasson. Use this link to access all of the material. 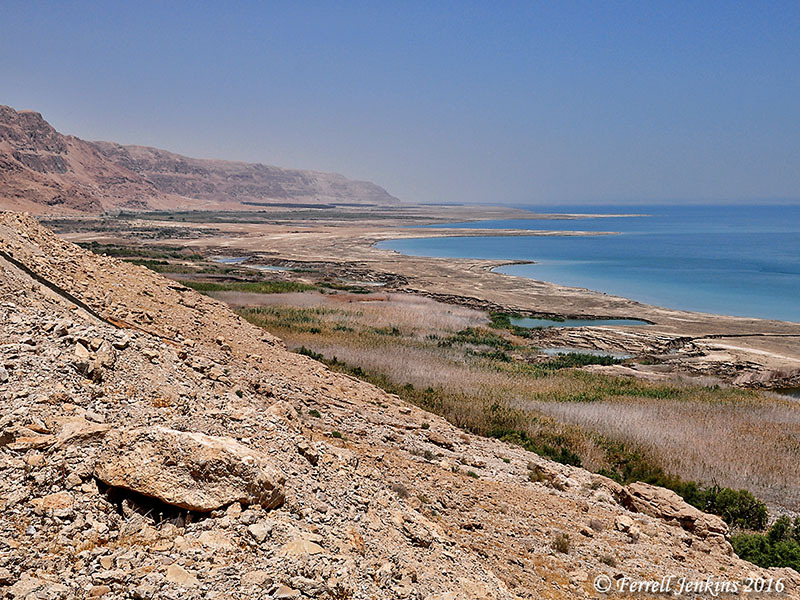 In 1972 the Dead Sea was about 1301 feet below sea level. This year it is more than 1407 feet below sea level. Water that once flowed all the way from Mount Hermon and the streams of both Cis-Jordan and Trans-Jordan is now being used to provide water for the population and agricultural interests. In my photo below you will see a few of the sinkholes that have been formed in recent years. According to Hasson there were 220 sinkholes along the shore in 1996, but in 2015 the count had risen to 5,548. The water of the Sea once covered all of the area below where I was standing to make the photo. Sinkholes along the western shore of the Dead Sea. Photo by Ferrell Jenkins. Previously we have called attention to the photos of the sinkholes by Shmuel Browns, Israel Tour Guide. This would be a good time to take a look at them if you have not done so before. Go here. The Dead Sea is called the Salt Sea in the Old Testament (Genesis 14:3; Numbers 34:3, 12; Deuteronomy 3:17, et al. This entry was posted in Bible Lands, Bible Places, Bible Study, Israel, Jordan, Old Testament, Photography, Travel. Bookmark the permalink. Be sure to check out the link to the Israeli newspaper article. It has some amazing photos as well as interactive graphics. It is a shame that it is getting harder to get to the Dead Sea due to the decrease in water level. It truly is in interesting place. Fascinating article and reports. The interactive shots in Nir Hasson’s article really drive home the dramatic change in the region.